What do you tell your child when a hero they look up to announces he hates them? How do or should we separate life achievements with life opinions? Without having a final solution, I do the next best thing, label it. I label this dilemma, "The Bobby Fischer Syndrome." As a little Jewish boy, I clearly remember Fischer's win over the dominant Russians. It stands with our moon landing and Olympic hockey team of amateurs beating them Russky's. In my ignorance and Jewish prejudice, I thought Fischer WAS a Jew. I was spelling it 'Fisher.' And my dentist, Dr. Fisher, was a Jew so Bobby must also be one. I may have heard about Fischer's rants during 9/11, but I was so busy trying to think they did not register. So when his death came over the wire last week I announced "Oh no, my hero", and my friend asked , "Your hero? ", reminding me of his anti semitic comments. As an adult, I thought, 'wow, he's nuts.' But if I had heard this as a kid, as many minority kids regretfully hear growing up from presumed heroes, I would have been heart broken. Minorities like Jews, African Americans, Indians, People from India, Hispanics, Asian and Middle Eastern Americans all share one thing as we try and live the American Dream. We root for America. We teach our children too, and we are crushed when our American 'heroes' announce we are different and not part of the team. Fischer will remain in my childhood memory as my hero, I am not going back and re-playing that track for that little kid named Barney. Fischer was a genius and turned many of us on to chess. This effect is much more powerful then his crazed remarks, and they came after he exited the spotlight, like Joe Namath's drunken kiss pitch on air. 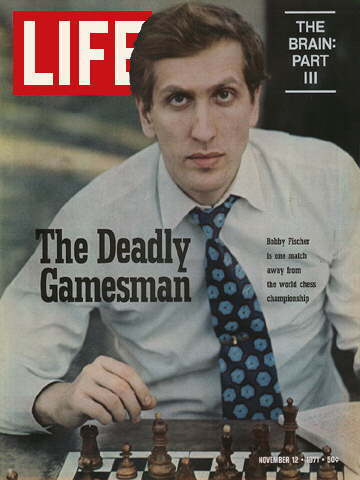 I forgive Bobby Fischer. Wherever he is now, he is being debriefed. (Find more here.) Some of these words are difficult to accept as possibly coined by Will Shakespeare. While words like "zany" or expressions like "shooting star" seem quite inventable, words that are simple, grammatical variants of preexisting words like "kissing" and "undress" (from bases "to kiss" and "to dress," respectively) seem more like they must have been circulating orally before Will wrote them down. 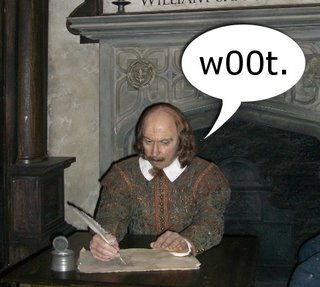 Thus, if you were to revise common wisdom to be more accurate, you'd say that Shakespeare's works contain the oldest written instances of about 1,500 English words... the difference being that the latter allows for the likely possibility that Will didn't invent a good number of those words but rather borrowed them from Elizabethan England's spoken vernacular. If you had been the first person to use the word metrosexual in a novel, 500 years from now it might have looked like you invented it—when, in fact, you heard it from your college friends while discussing why your male roommate owns 24 pairs of shoes. Yet what's the likelihood that Will Shakespeare happened to be the first person to write down so many common English words? Weren't people writing in English for a long time before that? Aside from the obvious possibility that prior usages have simply been lost to the ravages of time, The 'Pedia notes that prior to the sixteenth century "legal matters in England were conducted in French, Latin had been used to write history, philosophy, and theology, and for the most part [English] writers did not write in their native tongue [of English]." Apparently, Latin, not English, had been the language of choice for writers and poets until Shakespeare's time, so it's really not that surprising that he might've been the first person to pen them. From nouns, verbs and modifiers of Latin and Greek and other modern Romance languages, it is estimated that between the years of 1500 and 1659 30,000 new words were added to the English language. Wow, that's 189 words a year or one new word every two days! So perhaps Shakespeare could've been making up all those words; everybody seemed to be doing it. Such a rapid pace of linguistic creation seems strange for a time like the sixteenth century, when travel was arduous and communities were much smaller. Things tended change at a slower pace. But something special had appeared in the 1430's that changed the pace of the spread of information in Europe: Johannes Gutenberg's printing press. Suddenly more people could afford books, more people could read, and more text started being written in English. With so much new material and worldly attention giving it bigger shoes to fill, the English language was forced to grow. The language lacked a decent vocabulary and simply needed more words. From this perspective, it becomes more believable that Will could've invented a fair number of the words attributed to him... especially words like "puke" (which Shakespeare may have borrowed from German). It's a high five that doesn't involve actually contact, normally over a long distance where a real high-five isn't possible. Mix of "wireless" and "high-five", hence "wi-five" (wireless high-five). Each one of these posts multiple entries per day and still can't keep up with the actual pace of linguistic creation. (Try subscribing to some of these by RSS or email... they're fun!) My point is, if we invent dozens of words a day in the face of the technological and cultural revolution that is the Internet, then it's not so hard to imagine that Will might have been inventing words like crazy in the face of the English language's growth-spurt, spawned by a different but no less significant technological achievement. Whether he really made them or not, Will Shakespeare gets popular credit for those 1,500 words. While you'll probably never rack up so many yourself, if you stay on the cutting-edge of the English language you may, one day, get your own citation in the Double-Tongued Dictionary and live on forever in our lexicon... just like The Bard himself. Only slightly less famous. 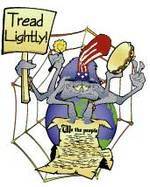 -- Ed Note: Can you name Words invented by the Grateful Dead in their lyrics? By fans? 1. a first or principal blogger of a blog's company who prevents comments. 2. a temperamental blogger; a blogger who takes adulation and privileged treatment as a right and reacts with anger to critical commentary or bans comments. n. A device for deactivating an impaired user's ability to post/comment on a blog. n. A weblog post during live read. To see live entries happen in realtime, added material to, or maintained live in a weblog during your visit to a blogsite. blogzing: Realization or Epiphany there is someone live on the other side of a website/post.